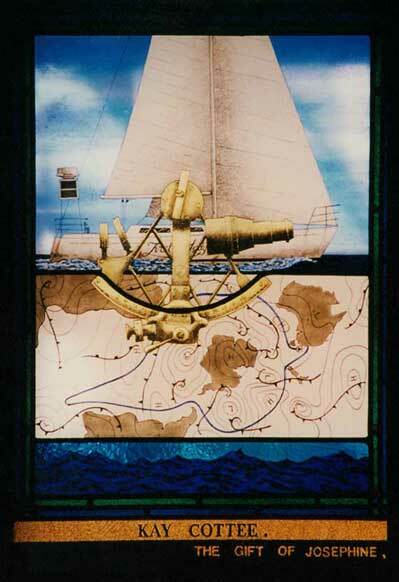 In the Beginning – Seaman’s Mission, Melbourne: Commemorative window, 600 x 900mm. 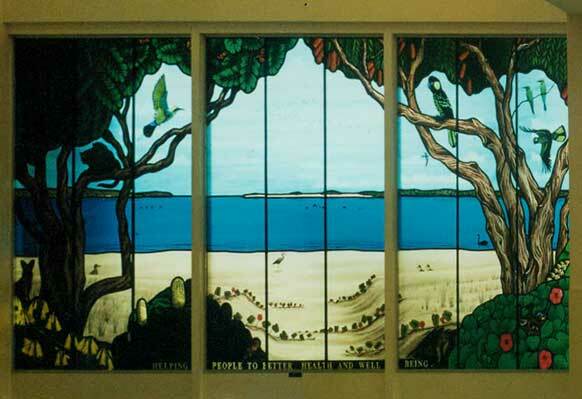 This was one of the first painted windows and shows the way to the future – extensive research, close collaboration with the commissioner, a distinctive contemporary Australian approach, and high painting skills. Leadlight. 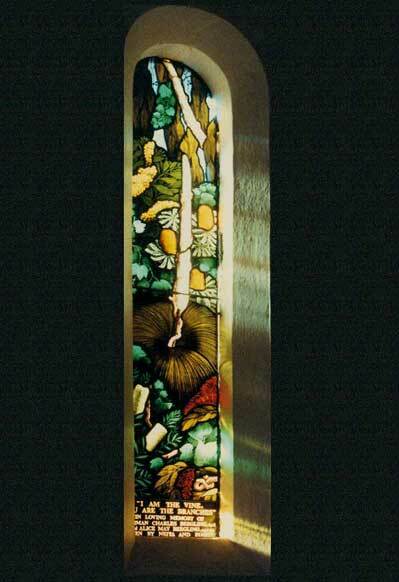 “Tree of Life” window with central silver stained crowned bullion. St. Monica’s Catholic Church, Evatt, Canberra. 3 metres high x 880 mm wide. 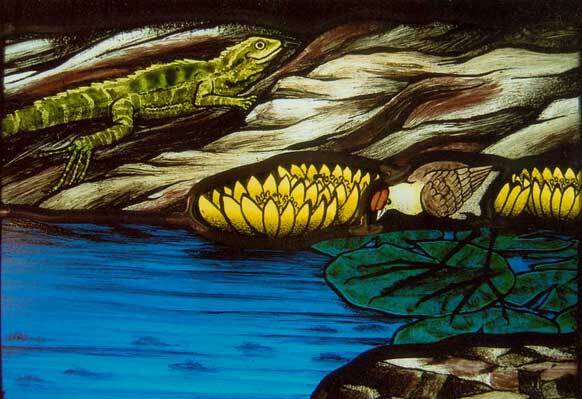 “Alpha” from the “Alpha and Omega” matching pair of leadlight windows. Christ Church, Bundaberg. Each 1400mm x 420mm. 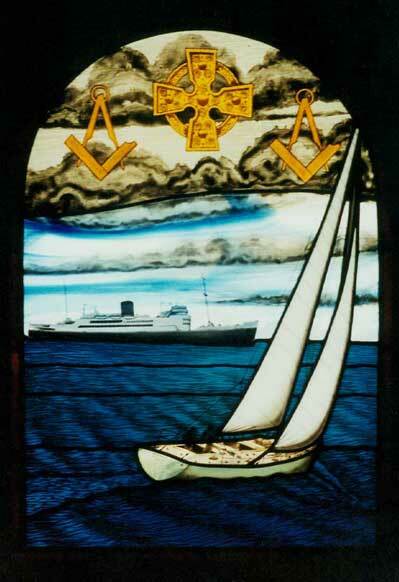 “Omega” from the “Alpha and Omega” matching pair of leadlight windows. Christ Church, Bundaberg. Each 1400mm x 420mm. 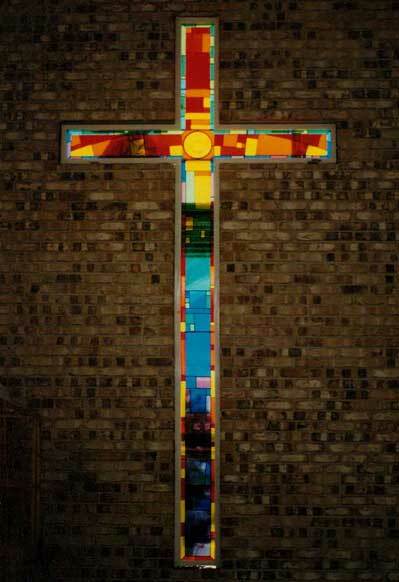 Rainbow Cruciform leadlight window with central silver stained crown bullion. St. John’s Lutheran Church, Corinda. Overall dimensions 4610mm x 2265 mm. 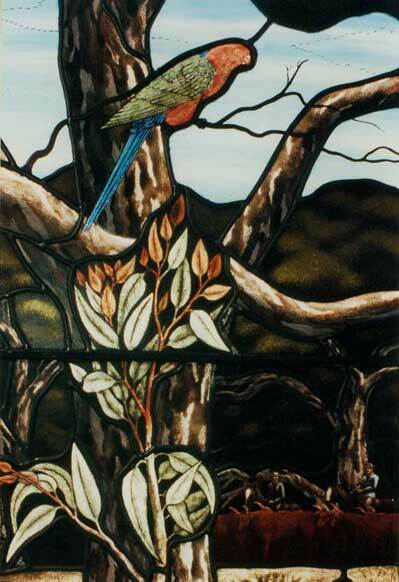 “Garden of Eden” stained glass West window. Fully painted and stained. St. John’s Anglican Church, Wagga Wagga. 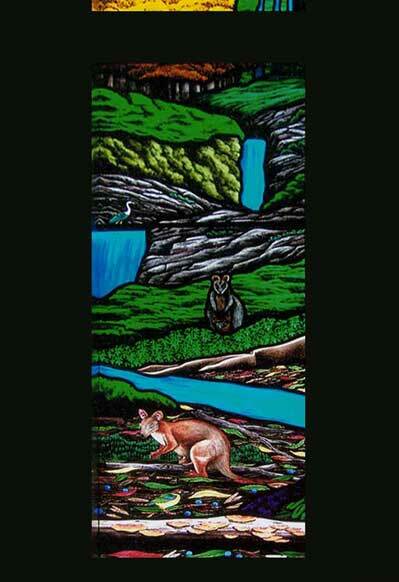 “Melaleuca Swampland” stained glass window. Fully painted. 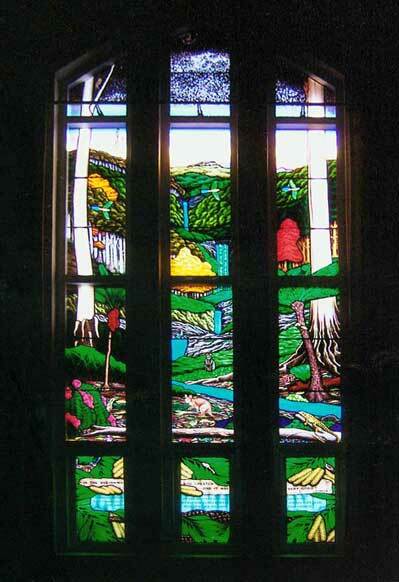 One of a set of four local landscape windows at Good Council Catholic Church, North Cairns. Each window is 1.8 metres x 1.2 metres. 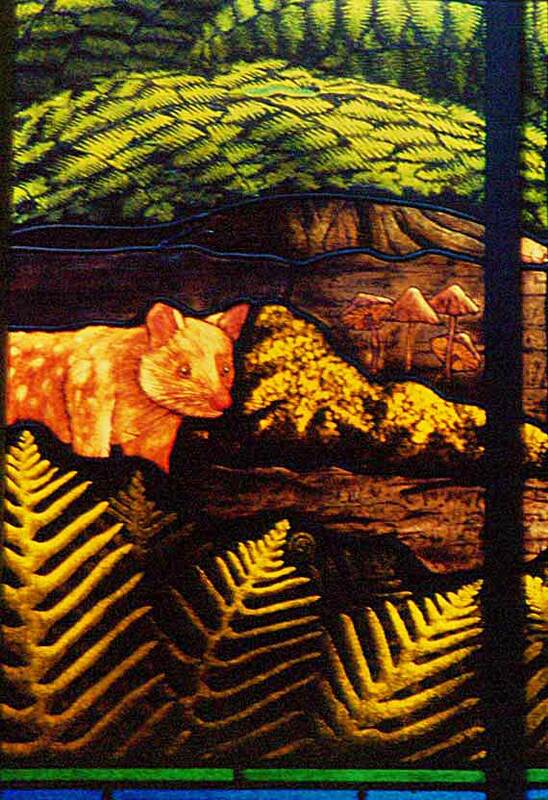 Detail from windows adjoining “Melaleuca Swampland” window. 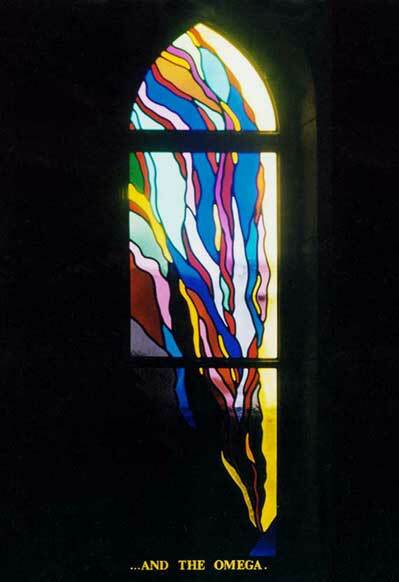 Semi-abstract “Baptism” window. Fully painted. St. Brigid’s Catholic Church, Dickson. 600mm x 4100mm. 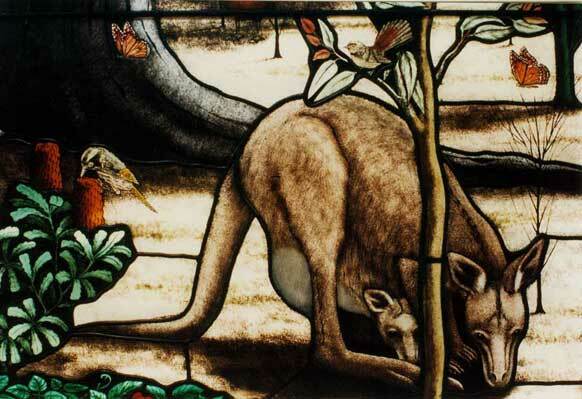 “I Am the Vine, You Are the Branches” stained glass window showing the European vine embracing Australian flora. Fully painted. All Saints Anglican Church, Tumut. 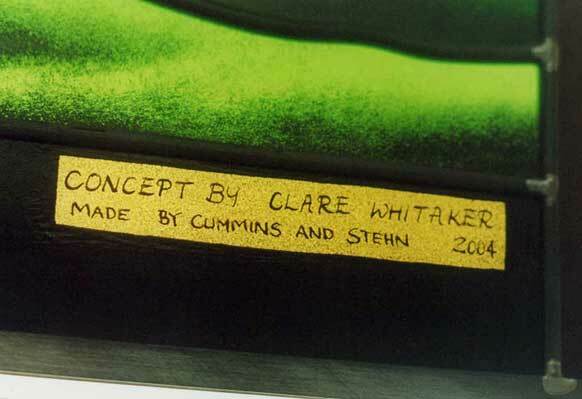 450mm x 1800mm. 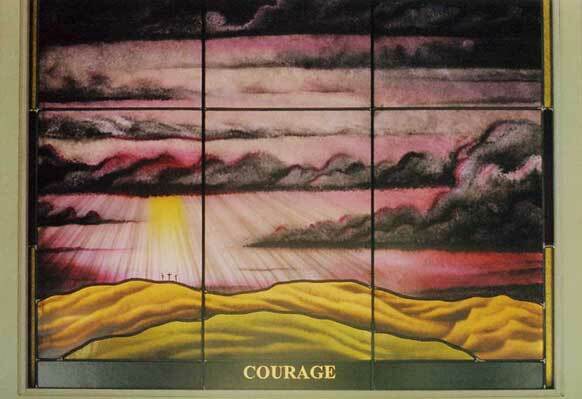 “Courage” (Crucifixion) and “Courage and Hope” stained glass windows. Fully painted. 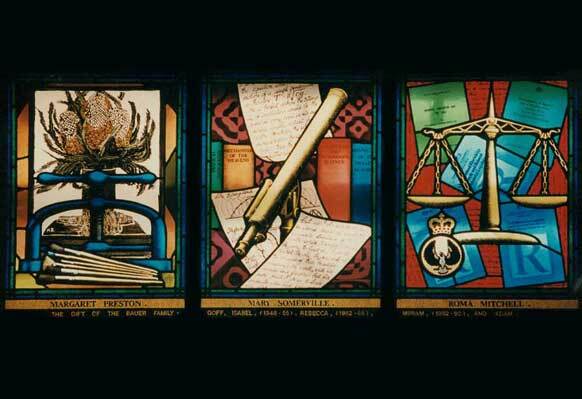 Two of a set of four windows (Faith, Hope, Love and Courage) each 1 metre high x 1.2 metres wide. 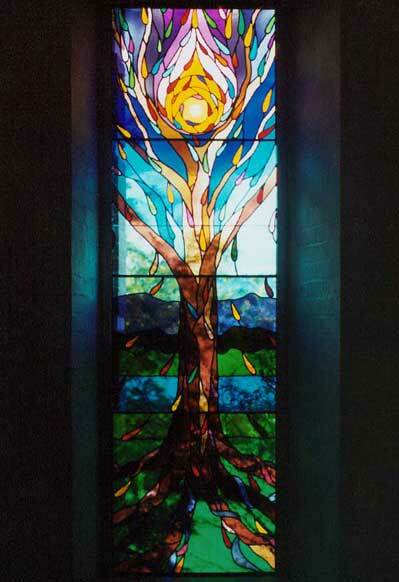 Moreton Bay College Girls’ School Chapel, Brisbane. 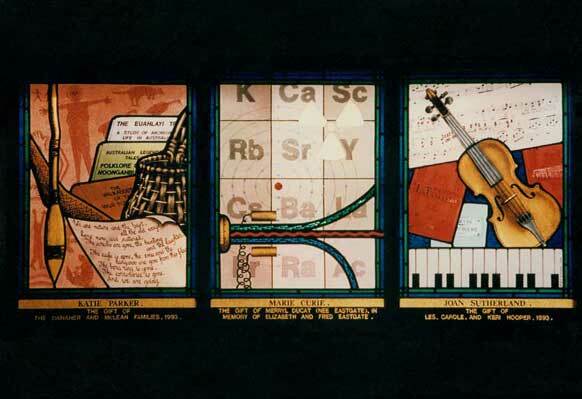 The project was a collaboration between the college and the stained glass artists. 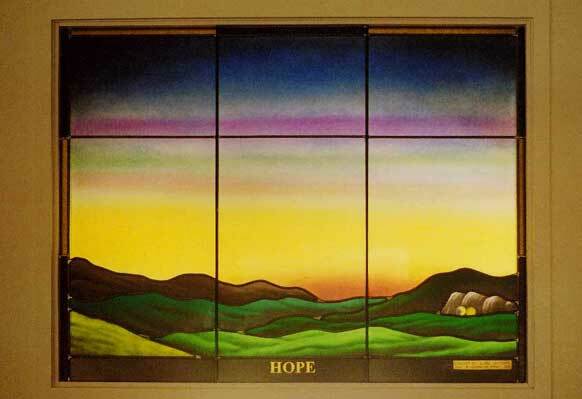 “Hope” (Resurrection) and “Courage and Hope” stained glass windows. Fully painted. 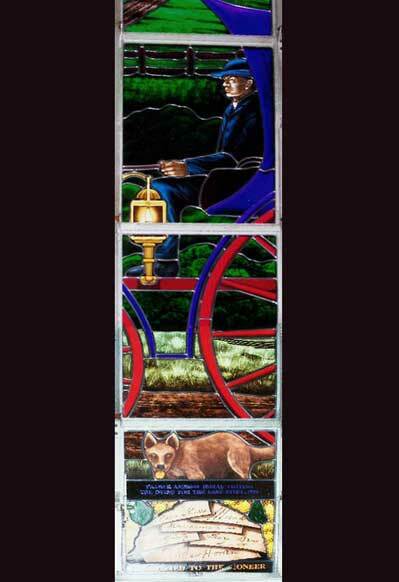 Two of a set of four windows (Faith, Hope, Love and Courage) each 1 metre high x 1.2 metres wide. 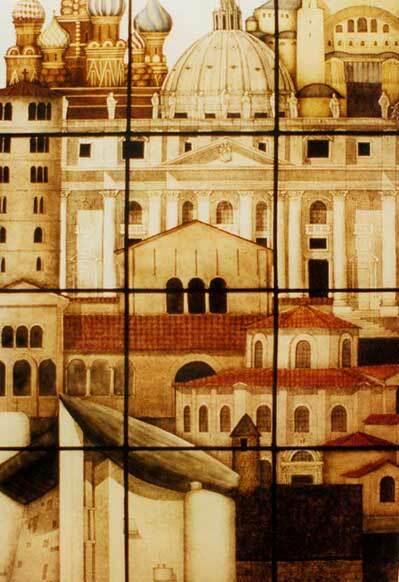 The windows jointly signed by the student and the artists each with their own hand. 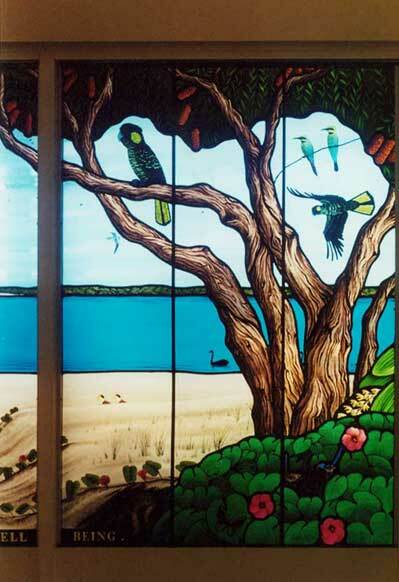 Hospital foyer “Tranquility” stained glass window based on local land and seascapes.Fully painted. Caloundra Hospital. 1.3 metres high x 3 metres long. 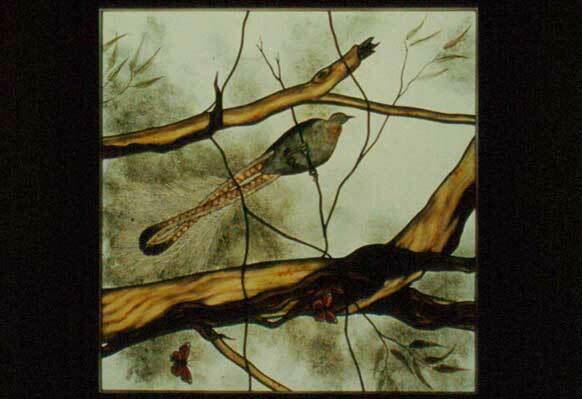 Detail of “Tranquility” window above. 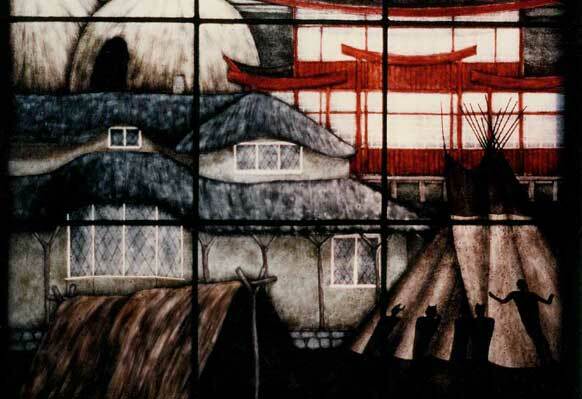 Another detail of “Tranquility” window above. 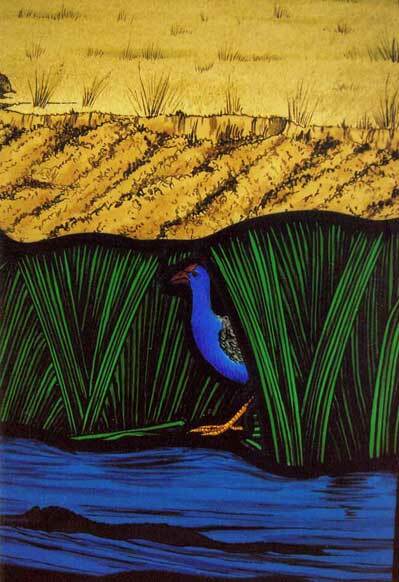 One of sixteen “Environmental” fully painted and stained ceiling panels each 1100mm x 1100mm. Another of the sixteen “Environmental” fully painted and stained ceiling panels each 1100mm x 1100mm. Detail of fully painted original Calvary Hospital in Cairns. 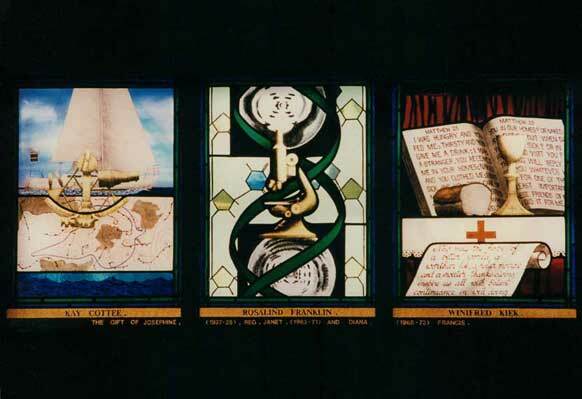 Full windows consists of five stained glass panels depicting the history of Calvary Hospital during its first forty-five years. 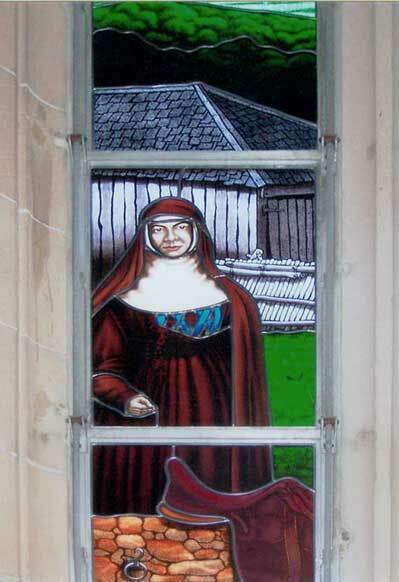 Fully painted “The Settlement of Hawthorn” library stained glass window. 1050 mm x 2100mm. City of Hawthorn Library, Victoria. 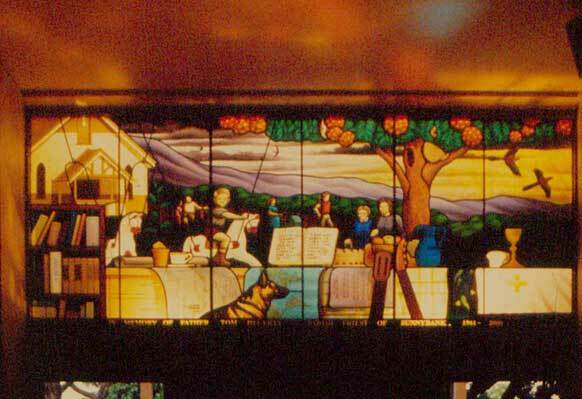 Detail of library window above. Another detail of library window above. 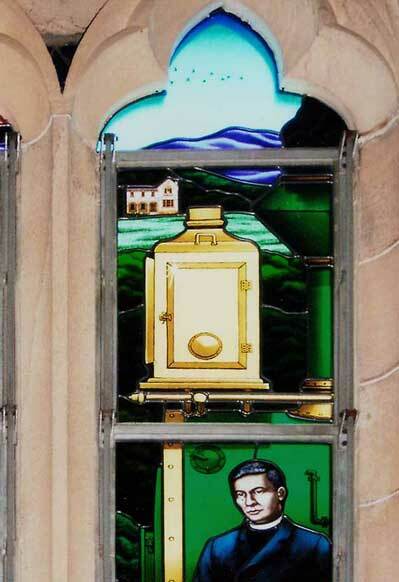 And another detail of library window above. 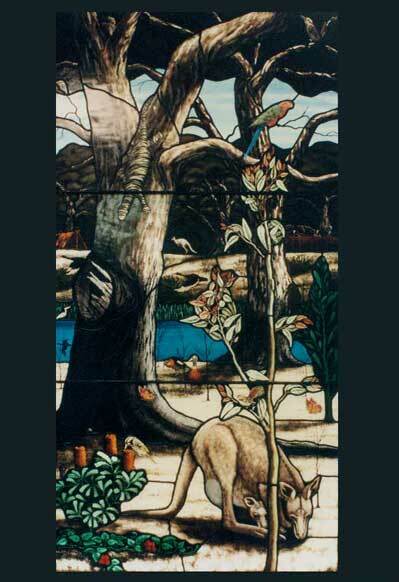 Fully painted “Garden of Eden” stained glass window. Somerville House Girls’ School Chapel, Brisbane. 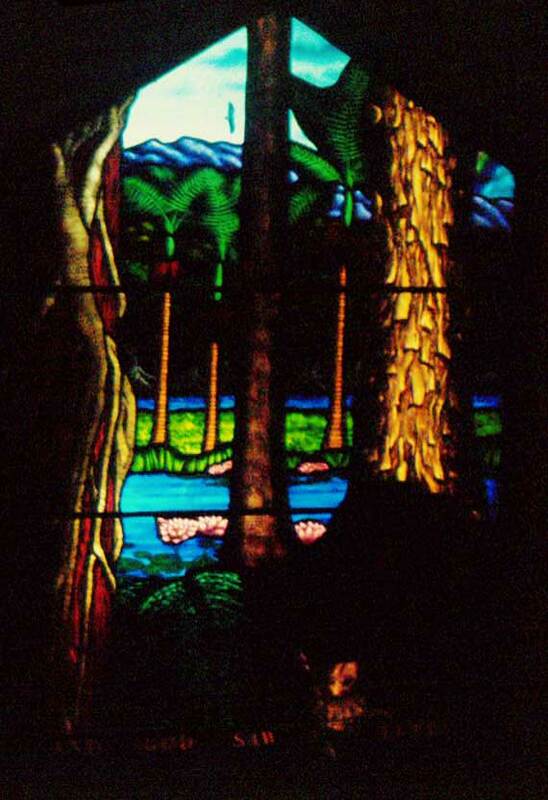 Detail of “Garden of Eden” window above. 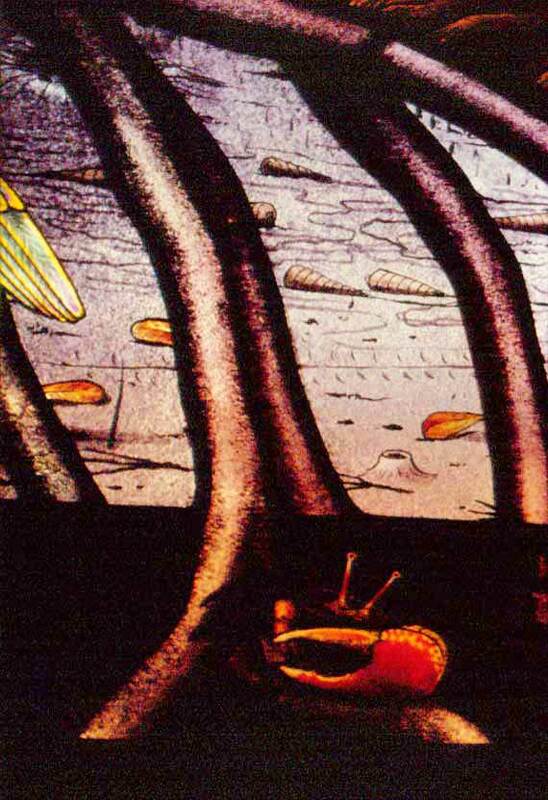 Panels from “The Women’s Windows”. Fully painted and stained. Somerville House Girls’ School Chapel, Brisbane. 850mm x 540mm. 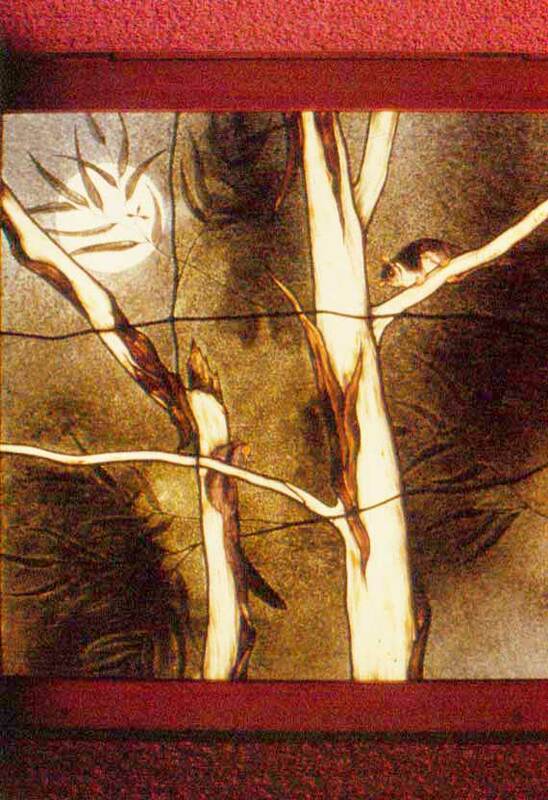 Roma Mitchell panel from “The Women’s Windows”. Fully painted and stained. Somerville House Girls’ School Chapel, Brisbane. 850mm x 540mm. More panels from “The Women’s Windows”. Fully painted and stained. Somerville House Girls’ School Chapel, Brisbane. 850mm x 540mm. 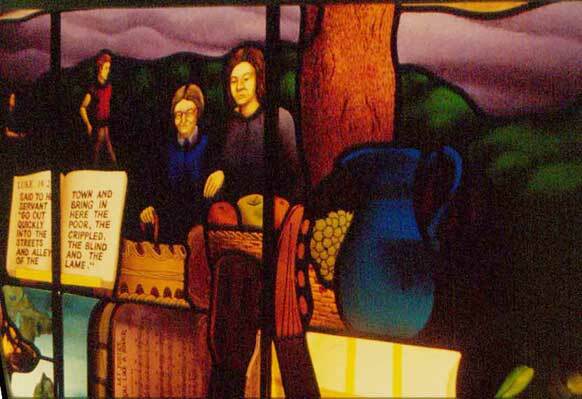 Kay Cottee panel from “The Women’s Windows”. Fully painted and stained. Somerville House Girls’ School Chapel, Brisbane. 850mm x 540mm. 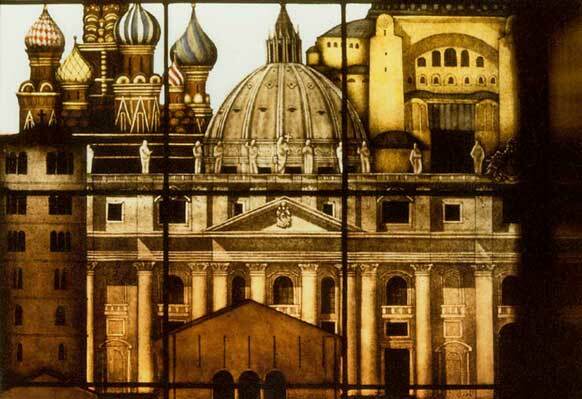 Joan Sutherland panel from“The Women’s Windows”. Fully painted and stained. Somerville House Girls’ School Chapel, Brisbane. 850mm x 540mm. 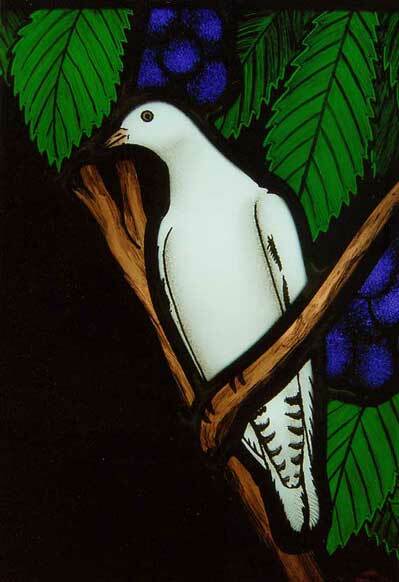 “Holy Spirit” stained glass window. 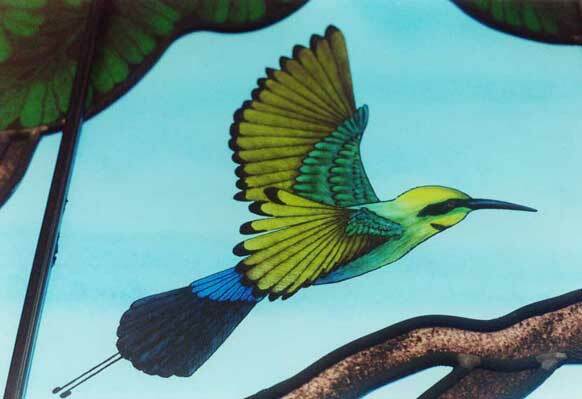 One of two windows collaboratively designed with PNG artist Martin Morobubuna. Holy Spirit Catholic Cathedral, Kerema, Papua New Guinea. 2.2 metres high x 960 mm wide. 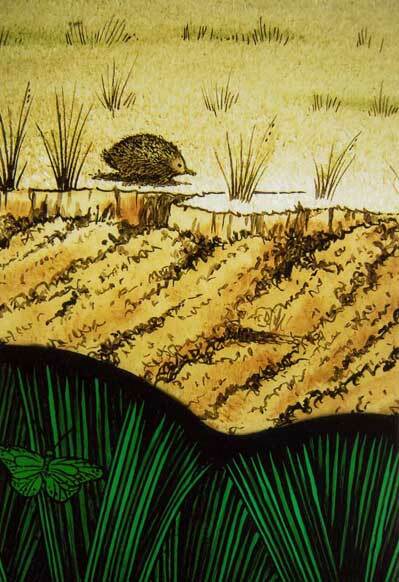 Details from local landscape window. St Clare’s Catholic Church, Tully. 1.7 metres high x 900mm. 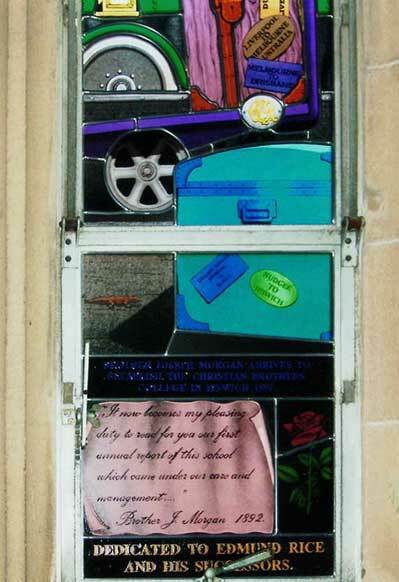 Biographical stained glass window celebrating the Life of Fr Pat McCormick. Regina Caeli Catholic Church, Coorparoo, Brisbane. 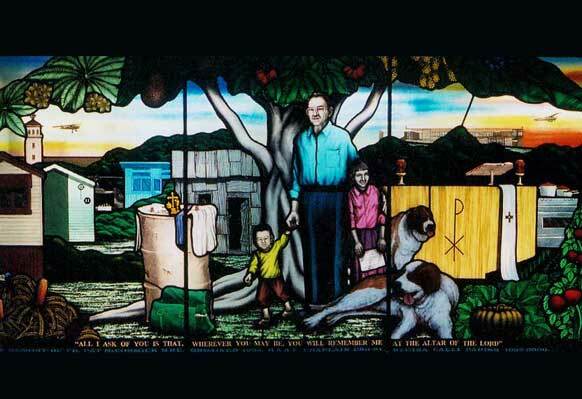 The church wished to commission a window commemorating the life and works of Fr. Pat McCormick, who had been parish priest for many years. 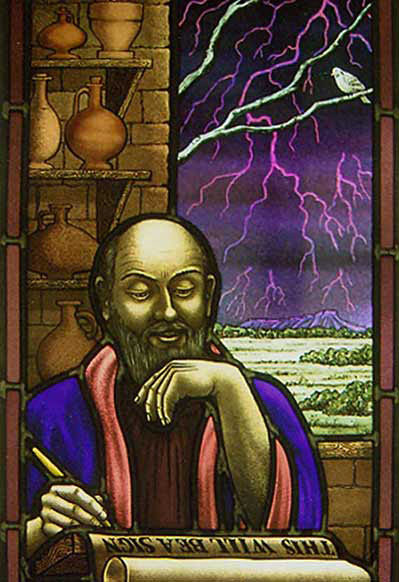 Cummins and Stehn designed this biographical window, which tells the story of Fr Pat’s life. It begins on the left with the family home, traces his attraction to aircraft, his time as chaplain during the Vietnam war, his work establishing an orphanage in Vietnam, the rusty 44 gallon drum at an Aboriginal settlement upon which he celebrated mass, and then his parish church at Coorparoo, the plane in which he made his last flight, and his famous dogs and vegetable garden, and the stove on which he cooked for those in need. 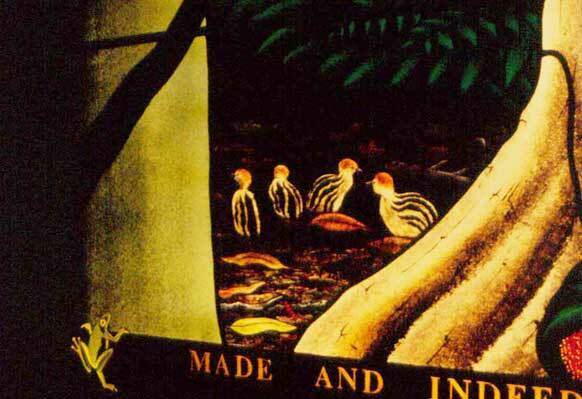 He stands with a Vietnamese orphan and a first communicant under a Tree of Life which depicts flora from the geographical regions he served in. 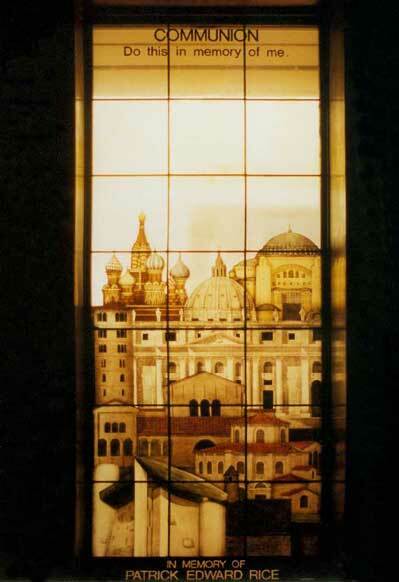 It is a unique and memorable window. 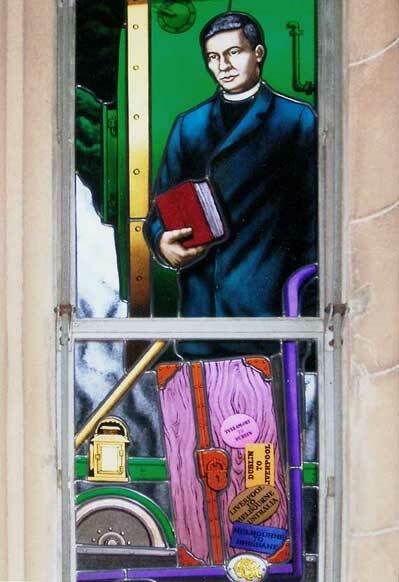 Biographical stained glass window celebrating the life of Fr Tom Hegerty. Our Lady of Lourdes Catholic Church, Sunnybank. 1.2 metres high x 2.6 metres wide. 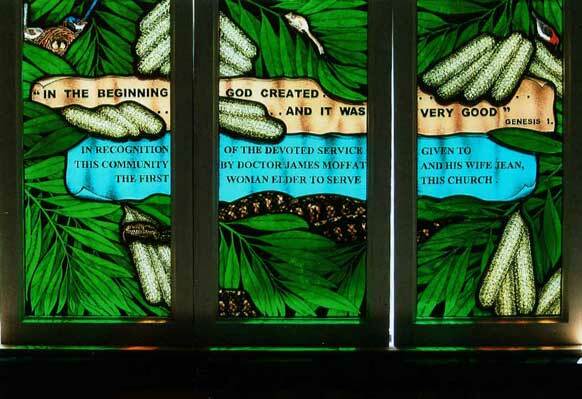 This window was also designed as a memorial to a much loved, long serving parish priest, and tells the story of his life based around the parable of the Great Feast. It depicts the original wooden church, which was replaced by the current brick church when the congregation grew, a merry-go-round used as a fund raiser to build the church, a progression from office to altar in the foreground, and the red flowering eucalypt which he planted, in the background. The whole of the composition moves from left to right where the sick, the lame and the homeless are gathering for the Great Feast. 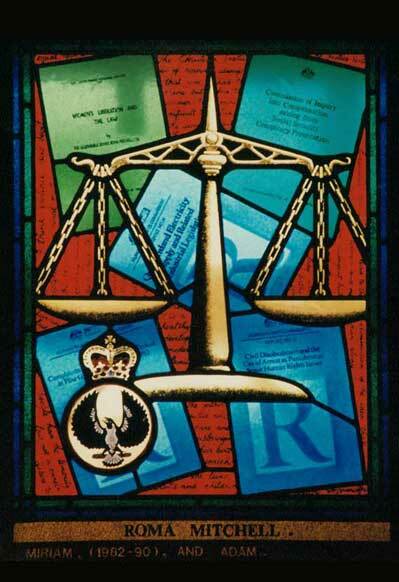 Again, the window has been designed to suit the specific needs of the commissioner. 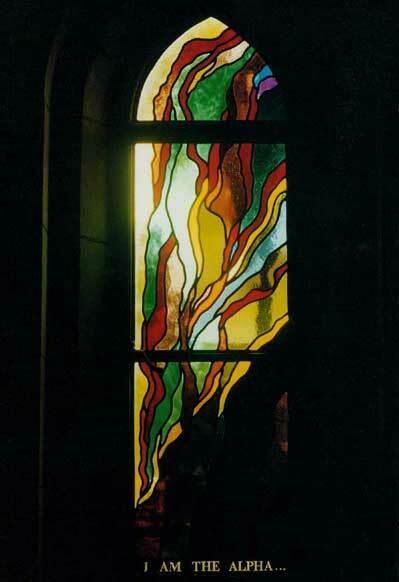 “Communion” stained glass window. Fully painted. 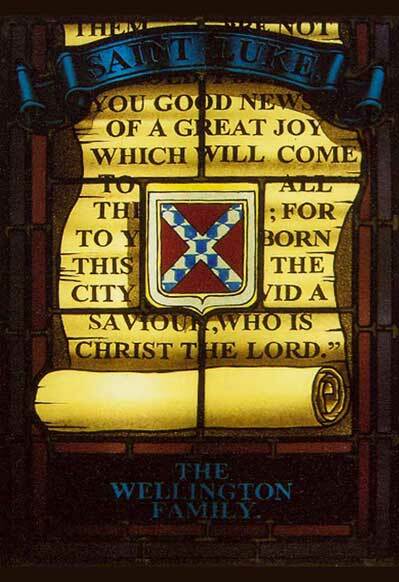 One of a set of two windows, the companion window of which is “Baptism”. Catholic Church, Ainslie, Canberra. Each 900mm x 1800mm. 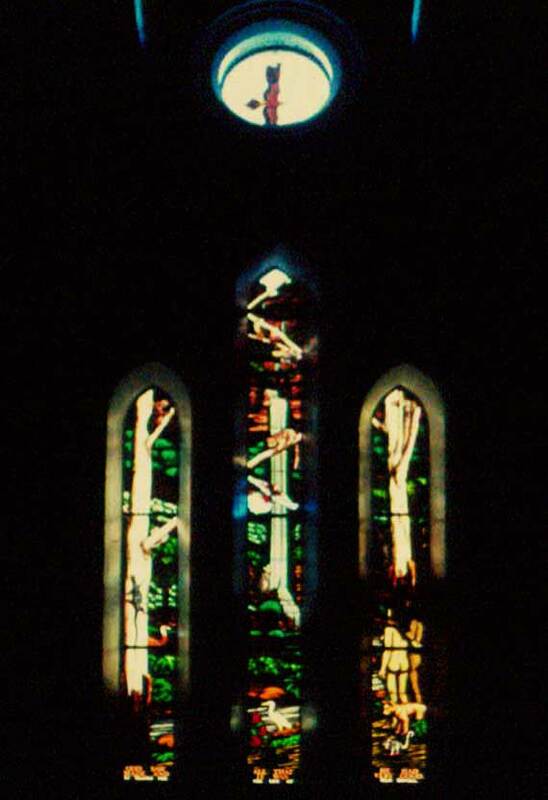 Detail of “Communion” window above. 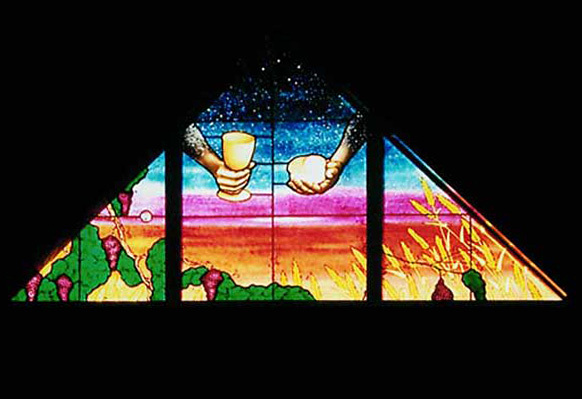 Close-up detail of “Communion” window above. 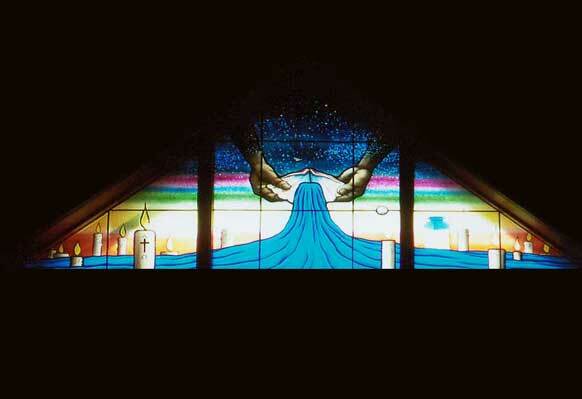 Detail of “Baptism” window from the Ainslie Catholic Church. 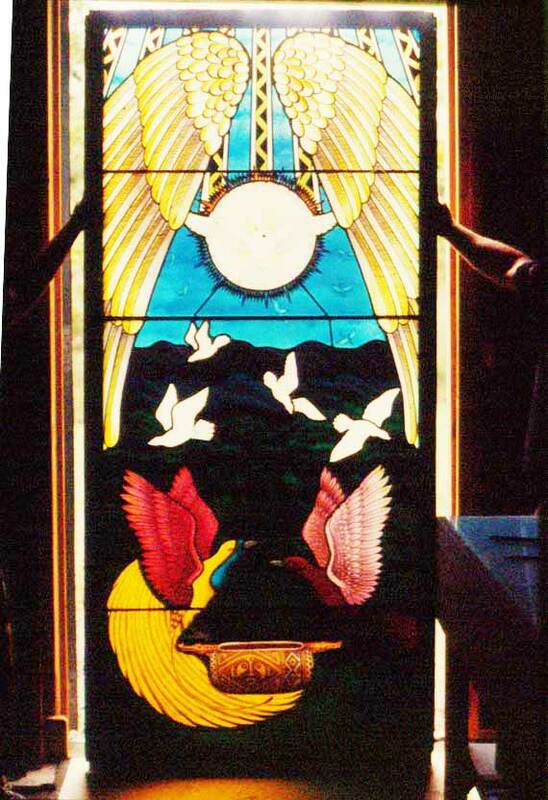 “Baptism” window. 2 square metres. St Oliver Plunkett Catholic Church, Cannon Hill, Brisbane. 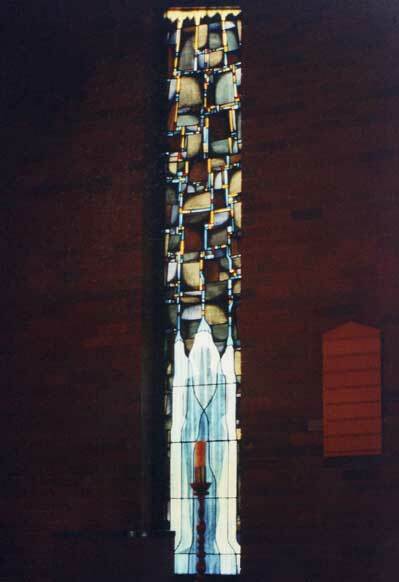 Companion “Communion” window showing effects of cast light on ceiling. 2 square metres. St Oliver Plunkett Catholic Church, Cannon Hill, Brisbane. 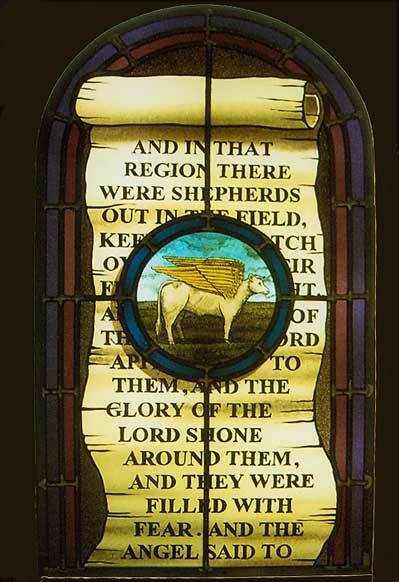 One of a set of four Centenary windows in St Mary’s Catholic Church, Ipswich. Each 3 metres high x 450mm. 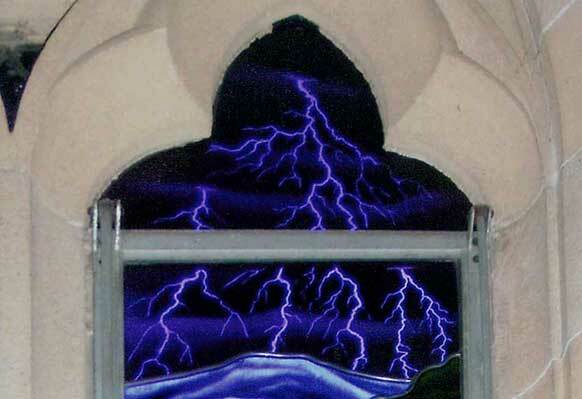 This detail is the lightning from the top section of a window depicting Fr Andrew Horan, long time parish priest of St Mary’s, Ipswich. 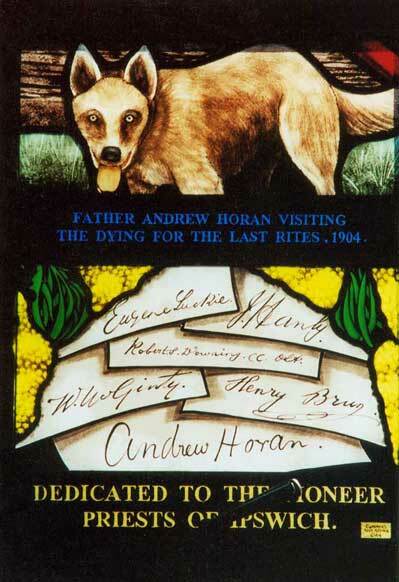 Father Andrew Horan delivering the last rites. St Mary’s Church, Ipswich. 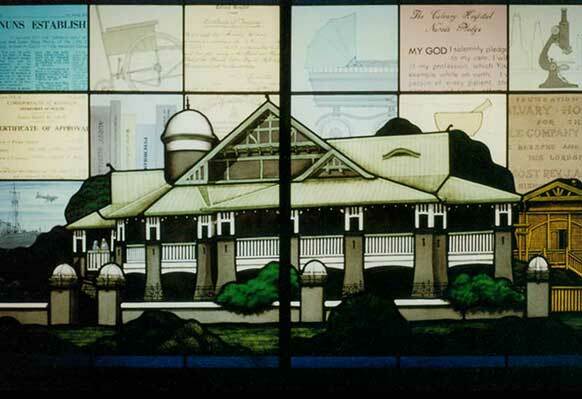 Window depicting the arrival of Brother J. Morgan in Ipswich in 1892 to establish the Christian Brothers College. 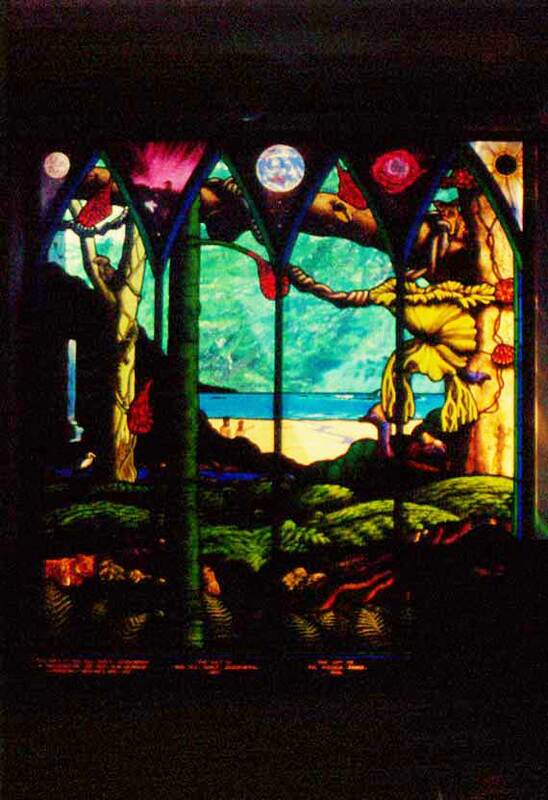 Close-up of the bottom of the Brother J. Morgan window above. 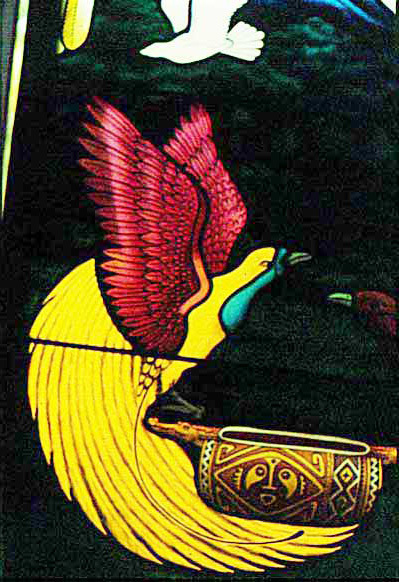 Close-up of the figure from the Brother J. Morgan window above. 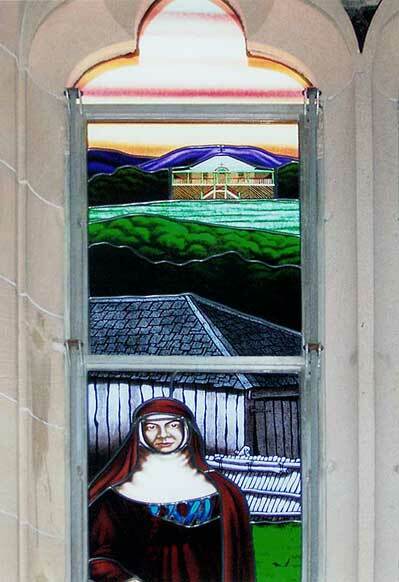 Window depicting Mary MacKillop, founder of Josephite convents in the districts around Ipswich. St Mary’s Church, Ipswich. 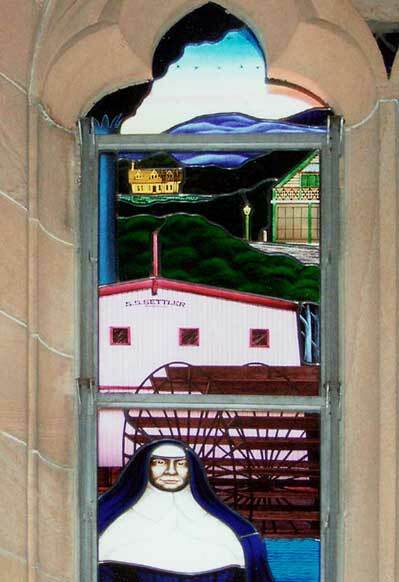 Detail of the Mary MacKillop window above. 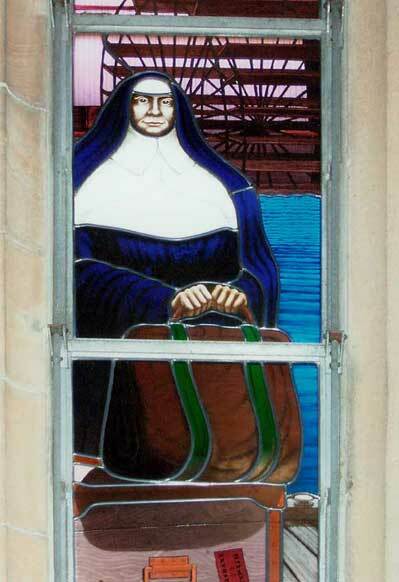 Close up of the top of the Mary MacKillop window above. 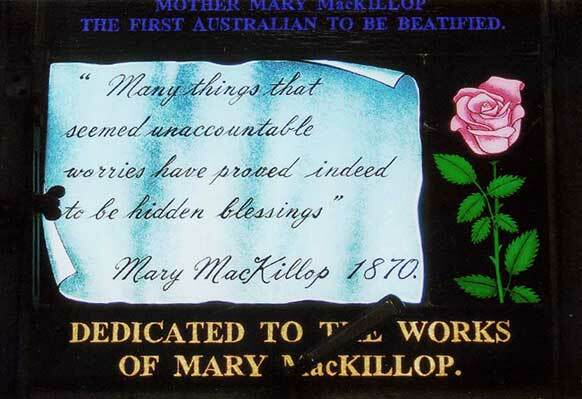 Base of Mary MacKillop window above. 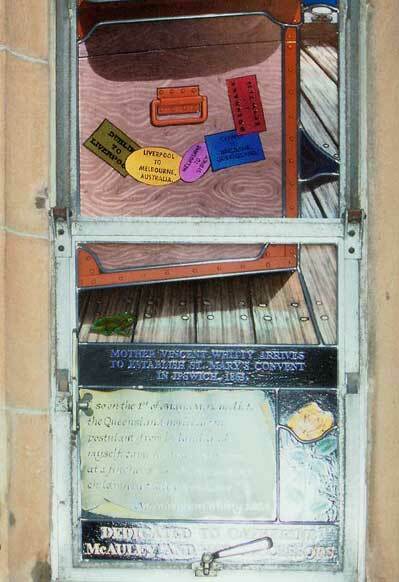 Window depicting the arrival Mother Vincent Whitty, who established the Sisters of Mercy Convent in Ipswich, St Mary’s Church, Ipswich. 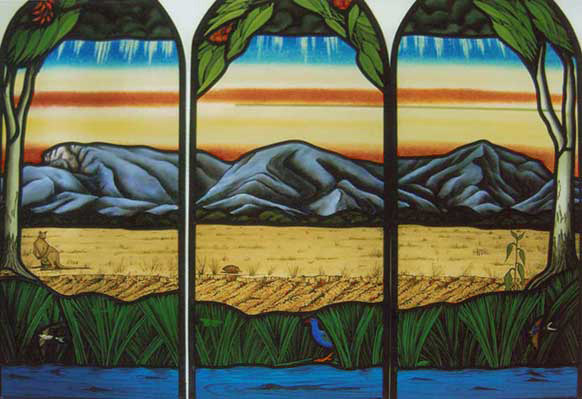 Detail of the Mother Vincent Whitty window above. Centre of the Mother Vincent Whitty window above. 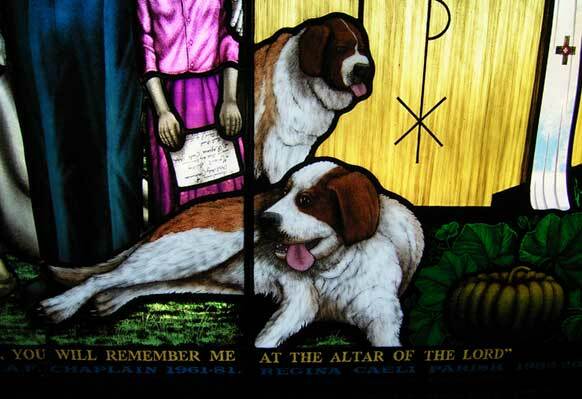 Base of Fr Andrew Horan window, showing the signatures of the pioneer priests of the parish, St Mary’s Ipswich. 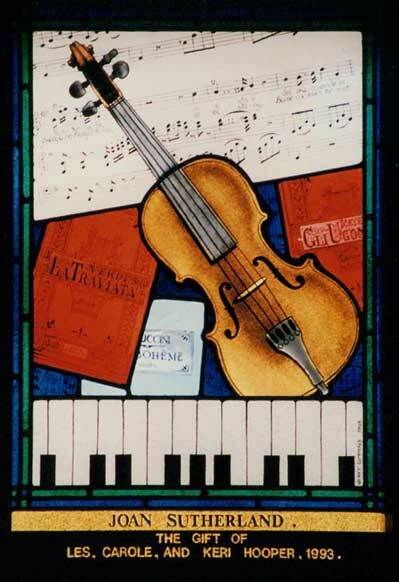 “St Luke” stained glass window. Fully painted. All Saints’ Anglican Church, Clermont. 2 metres high x 400mm wide. 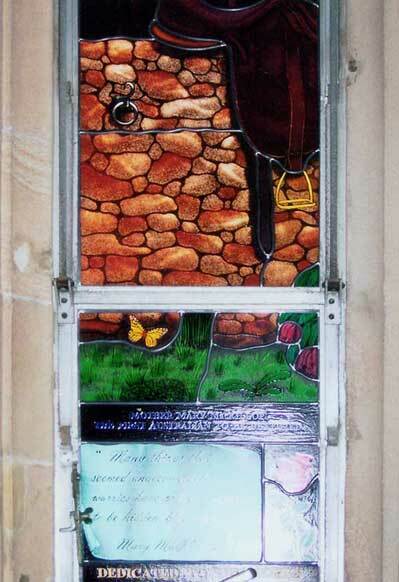 Detail from St John’s Anglican Church, Biggenden above. 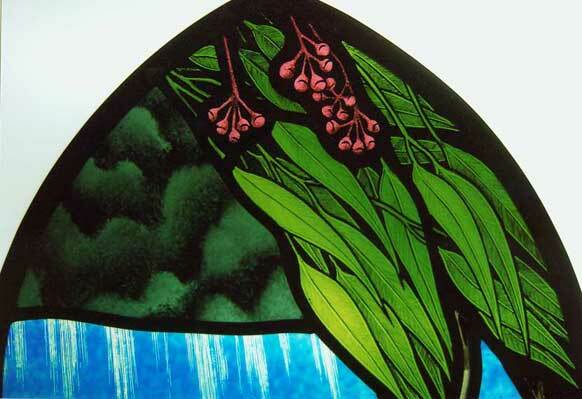 Another detail from St John’s Anglican Church, Biggenden above. A close-up detail from St John’s Anglican Church, Biggenden above. 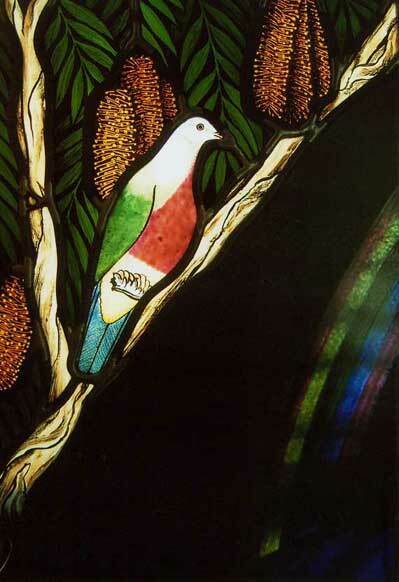 “Garden of Eden” stained glass window. Fully painted. Uniting Church, Nambour. 4.5 metres high x 2 metres wide. 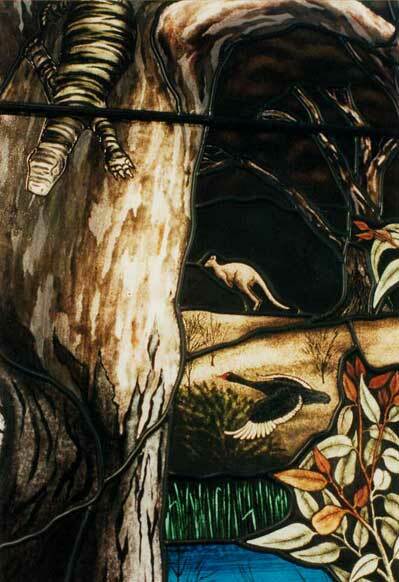 Detail from “Garden of Eden” stained glass window above. 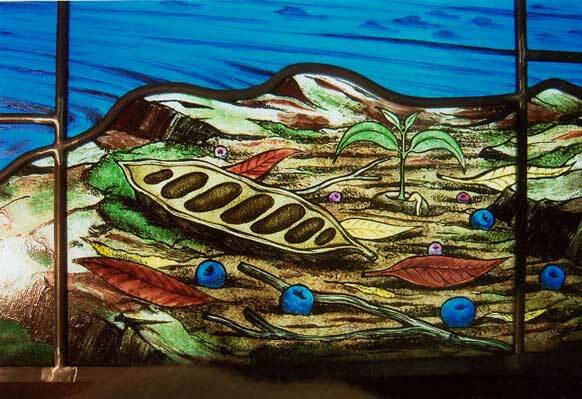 Another detail from “Garden of Eden” stained glass window above.